Earlier this week, we explored the story of how social media has impacted The Roxy Theater in L.A.. And now we’re continuing our series on concert contests, with this news about how up-and-coming artists nationwide can win a chance to perform at The Roxy and the New Music Seminar in Los Angeles! 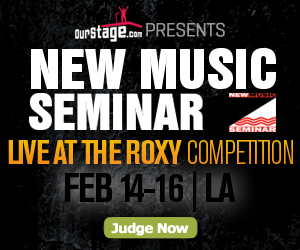 Online music discovery site OurStage.com is teaming up for a third time with the New Music Seminar (NMS) to launch the “Live at the Roxy” Competition. The contest began December 13, 2010 and runs through January 23, 2011. All singer-songwriter, rock, and pop artists can submit their best original track for fan judging at www.ourstage.com/go/live-at-the-roxy. One lucky OurStage.com Artist will be selected from the Top 20 ranked finalists to perform in front of music industry heavyweights at the NMS closing ceremonial party on February 16, 2011. The winning artist will also receive $2,000 in travel stipends and online promotion through OurStage.com. A panel of music experts at NMS and OurStage.com will choose the grand prize winner from the top ranked artists in the competition. Artists must own 100% of the rights to the music they submit, and must be eighteen (18) years of age or older at the time of entry. Individual artists or a band member must be a legal resident of the 48 contiguous United States. For official rules and competition information, view or download a pdf here. What is the New Music Seminar? A variety of music industry pioneers will speak at the New Music Seminar, including Michael Doernberg (ReverbNation), Pete Edge (President A&R Jive Records), Courtney Holt (President of MySpace Music), Tim Westergren (CEO of Pandora), Megan Jacobs (The Roxy LA) and others. For a complete list of NMS speakers and details you can visit newmusicseminar.com. Plan on entering the contest? Have you entered before and want to share your story and experience? The comments are yours!